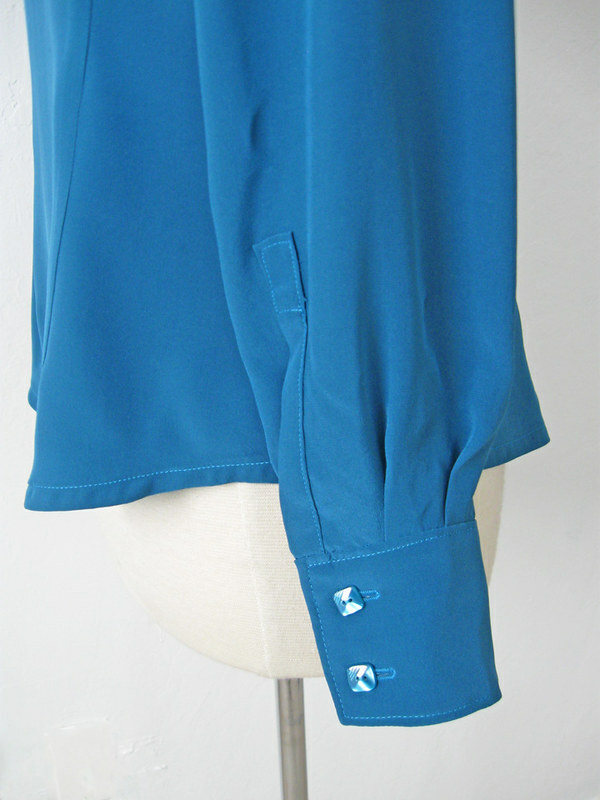 This teal green silk blouse has been a while in the making. Actually I should clarify, it is probably this post that has been a while in the making. 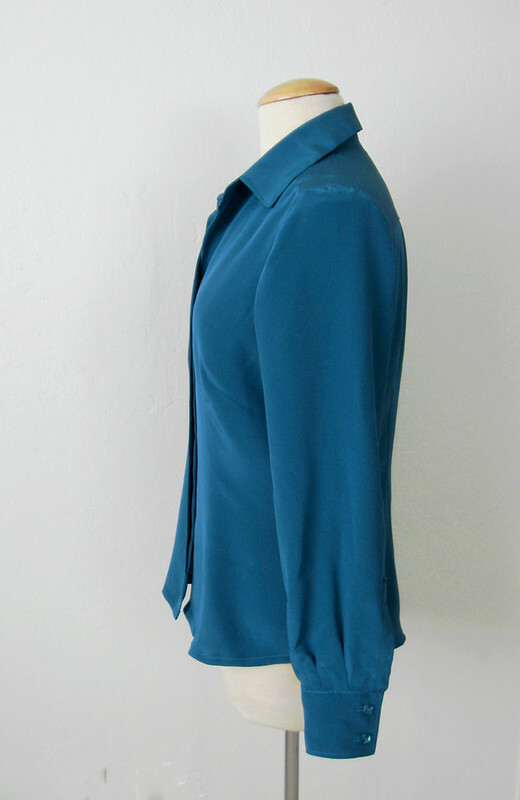 I had the idea to make another silk blouse with the hidden buttonhole placket which I first did in 2011 where I used a silk charmeuse that had a bit of stretch. 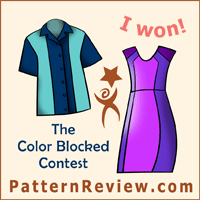 I had never been quite happy with that version - although I wear it all the time and the color is definitely one of my favorites. So earlier this year I decided to try out this project again, starting from scratch and worked out all the details on this blouse in a printed silk. And then I figured it would make a nice how-to post for Craftsy in the solid color. So here it finally is. Plus I have been wearing it a lot! Quite surprised at the frequency but it does hit all my sweet spots - bright jewel tone, luscious silk, goes with a lot of other stuff in my wardrobe, looks dressy but wearable with jeans. 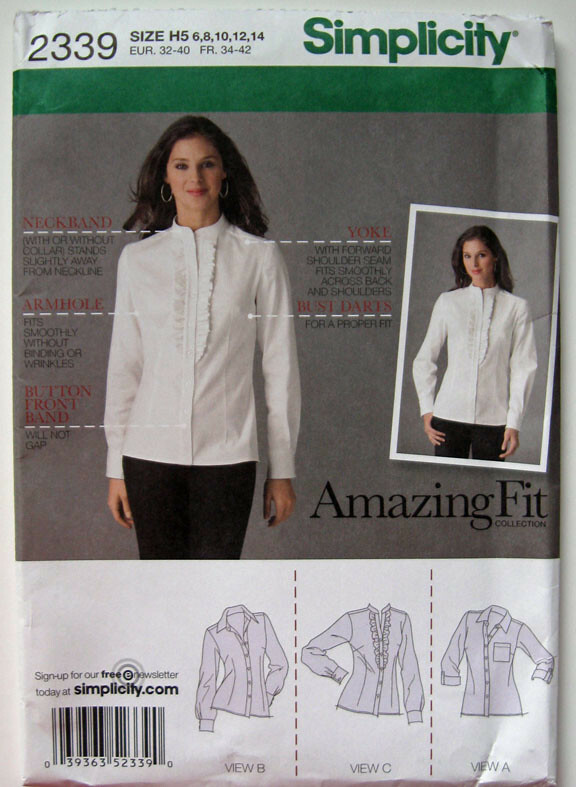 This is my 8th version of this pattern, Simplicity 2339, an Amazing fit pattern. The one with the hideous version on the envelope. Anyway - if you can figure out what size to make for your shoulders and work your way down with fit (usually taking out some ease) then I think they are really useful as basic patterns. Every time I look at this I just feel relief that any potential buttonhole mishap in this delicate fabric is hidden from view. 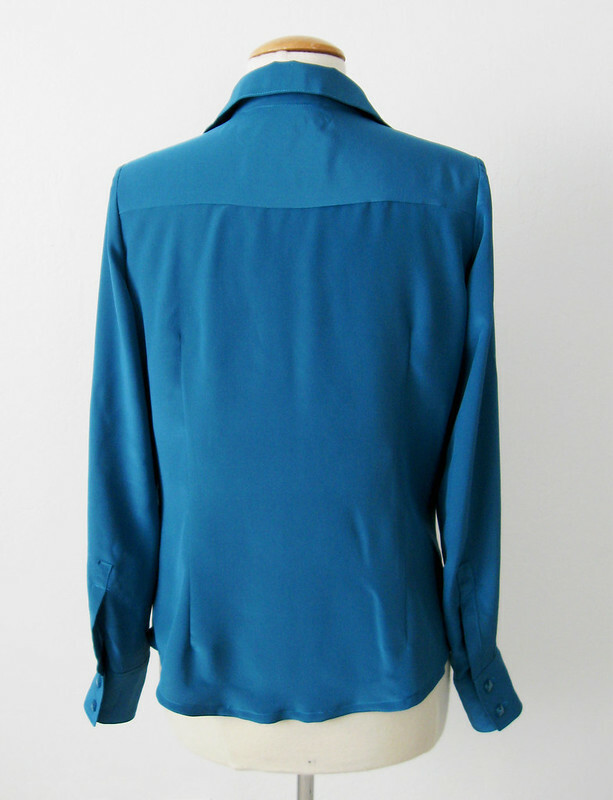 Plus the sleek front seems right with silk crepe de chine. A few other construction details, and how rewarding is it to press silk? Am I weird to enjoy this? It is just so satisfying to get that nice crisp crease on a silk fabric. Of course sometimes the iron is in the wrong place and you create a crease where it is not wanted but in a nice silk fabric it usually presses out again. I bought this fabric at Fabric Outlet on Mission St. in San Francisco during one of their 40% off sales. 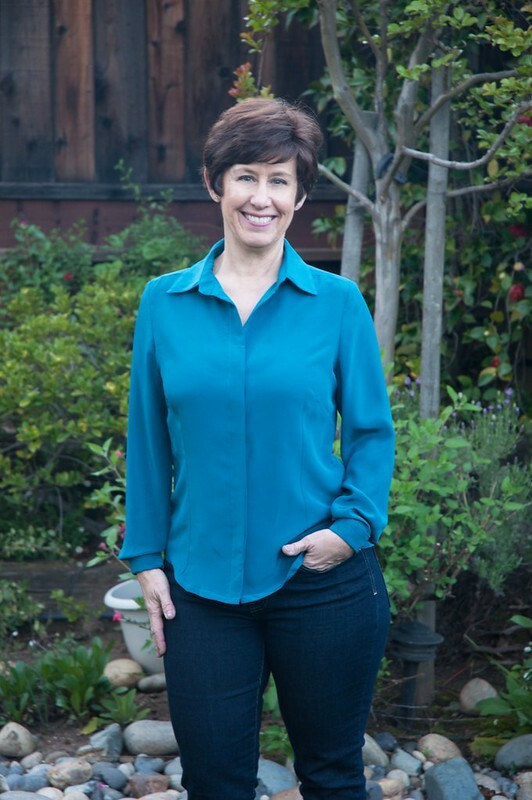 By the way, Tanya did a great post recently on fabric shopping in the bay area, here is the link. Check it out if you are traveling this way. I had these buttons in my button box. Score! I have no idea what I bought them for but I had 12 so perfect quantity for cuffs and center front. Plus they are square which is a detail I like. Also I finally figured out (sort of) my stupid buttonhole foot on my modern Singer machine. Although I still prefer the vintage attachment on my slant needle 1950's Singers but sadly it is not working properly (things don't seem to do as well after you drop them on the floor from height). There are a few different ways to do cuffs, such as attach from the inside and topstitch down on the outside, plus the reverse of that. I like to attach right sides together and then press in place, lastly stitching all around the cuff to enclose the inside. Though before I get there I press the seams open using my pressing stand. 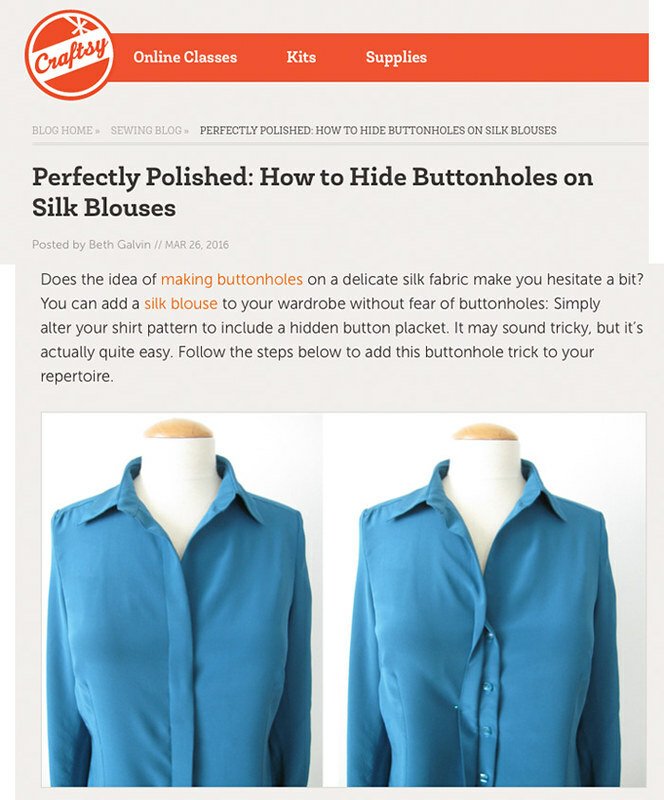 This is the same technique I use on lapels, collars etc. 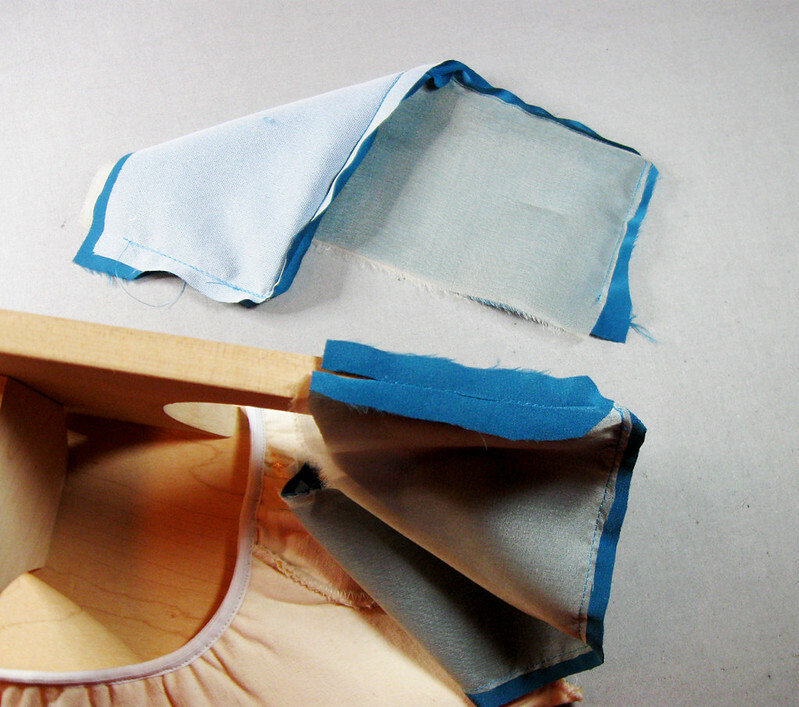 Press the seam open and then flip over and press on the edge - it is the way to get the sharpest edge possible. Looking at this photo I see that I used 2 types of interfacing in these cuffs, a lightweight fusible on one side and then silk organza on the other side as they seemed a bit wimpy with only the fusible. For the hem I stitched about 1/4" from the edge, which makes it easier to press and then turned and pressed again about 3/8". Typically I don't get that worked up about inside finishing but with a silk shirt it is nice to do french seams and there are really only the side seams and the sleeve seams to do that way so it did. I have narrowed the sleeves on this pattern a good about - like 1.5' as they seemed way to big around the arm for my liking. The shirt seemed too long when I tried it on so I cut off a bit of length and now wondering it is a smidge too short. And the other silk one I thought was too long! I am like Goldilocks - when will it be just right? Here is the link to the post on Craftsy. I just noticed that I didn't show the hidden buttonholes :) but you can see them in the photo below. So all in all, I think this is my new favorite colors. Plus I have some wool in this shade with a black pencil stripe plaid which will probably make an appearance in the fall for some type of jacket. Up next - I am sewing up a dress using fabric I designed on myfabricdesigns.com. I'm far from being an artist but it is interesting and of course you can choose the colors you like - prepare for some eye-searing fabrics in the next months. Although the first one is not crazy at all and came out really nicely, quite lovely and sewing up into a spring dress. Although not in time for Easter - which may be rainy but we are not complaining! Check out all that greenery behind me - the roses are loving it. 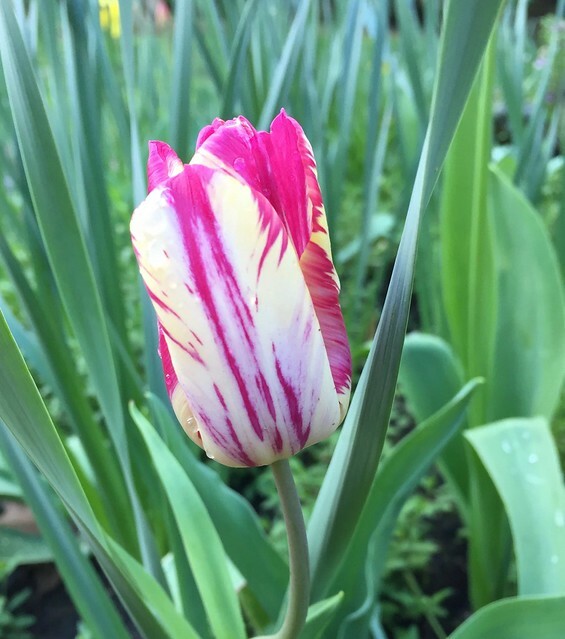 another gorgeous tulip appeared this week. I think I planted a few irises as well but they have yet to appear. Previously I have stated that I don't make many muslins ( a test garment prior to sewing with the real garment fabric) but in the past couple of years I have sewn them more and more. Trying out new to me pattern companies, sewing for others, doing pattern testing for an indie pattern designer - these are all reasons I've had to sew up a muslin. 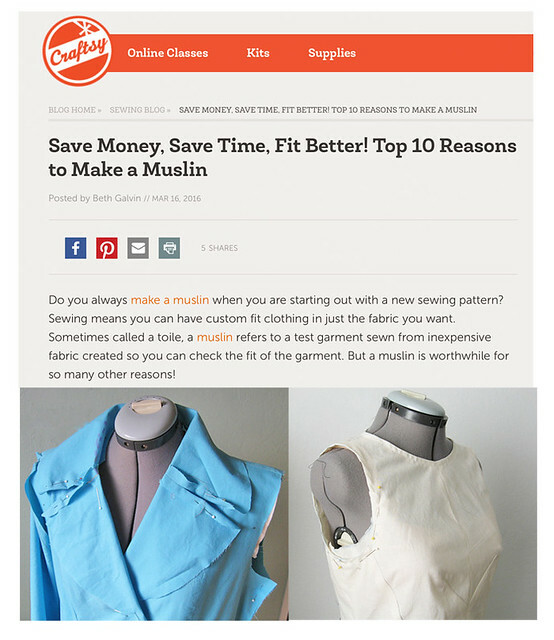 So I wrote a post for Craftsy on my top reasons to sew a muslin. In fact I was surprised by how many reasons I actually came up with. And all quite valid in various circumstances. Here is the link to the post which you can read there. Yesterday I had a 60% off coupon for Joann Fabrics so I went over there early and bought a few yards of the 120" wide muslin fabric for about $ 8. I try not to buy much actual muslin fabric but that is kind of a steal, and using the traditional unbleached muslin is really nice for fitting etc. I can mark all over it with a pen while fitting and see the markings easily so as to be able to transfer back to my paper pattern pieces. Also the unbleached muslin takes the markings from the waxed tracing paper very well. A while ago I bought a package of the red wax tracing paper and so I use that now to mark darts, seamlines etc. The red shows up really well on the muslin fabric. Sometimes I even go over the markings with pen/pencil because I really like to see all the dots and other markings when I am doing a muslin. 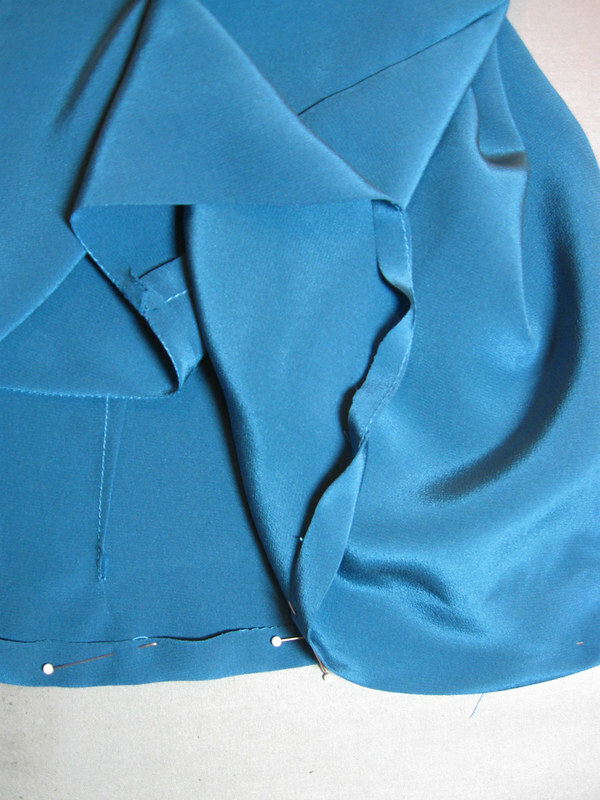 As for other options on muslin fabric - the example above left in blue is an old bedsheet. (for my black wool coat, Simplicity 2311, on the right is the muslin for my version of the House of Pinheiro Brasilia dress). While old and worn bedsheets might seem like a good choice for muslining garments I find them a bit troublesome. For one thing no selvage - so you have to figure out the grain on your own. Secondly most sheets are quite tightly woven and very difficult to pin. But in a pinch they will do. 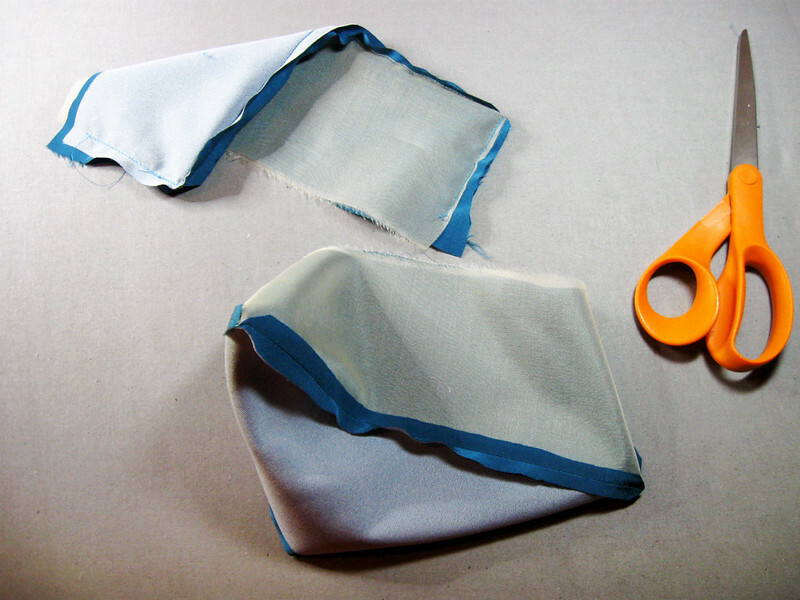 So I do prefer actual cotton muslin fabric - and I save all kinds of scraps when cutting out muslins - then on the next project for collars, or other small pieces I use any scraps first and then cut out the larger pieces. My miserly tendencies know no bounds! Another way to "find" fabric for muslins is to use quilting cottons and use the back side (without the printing) as the outer side of the test garment. If you are using quilting cotton the print can be a distraction when fitting but by flipping it over and sewing with the pattern on the inside you can get a less distracting version for your fit evaluation. I have bought a lot of muslin fabric at garage sales. Don't overlook some of the horrible stuff - particularly poly double knits which nobody has willingly sewn with since ? but is a really nice stand-in for a modern ponte knit when pattern testing. Thanks for the comments and emails on my idea about sewing instruction/consultation via Skype. I am working out my ideas and will be back soon with more details. Don't you think that is the case? Denim is so nice to sew. Today is a perfect day to hunker down and sew with a movie in the background and I was having no inspiration until I found a weirdly shaped denim remnant hanging up on my fabric rack. Score! It is barely enough for the project in mind, some creative cuts will be in order but already I can feel the creative juices flowing. 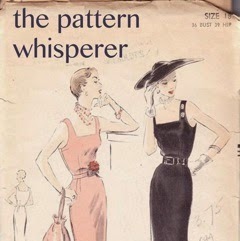 Pattern hint: Simplicity 8014, the cover version is perfection. I have been in a weird mood lately - sewing wise. 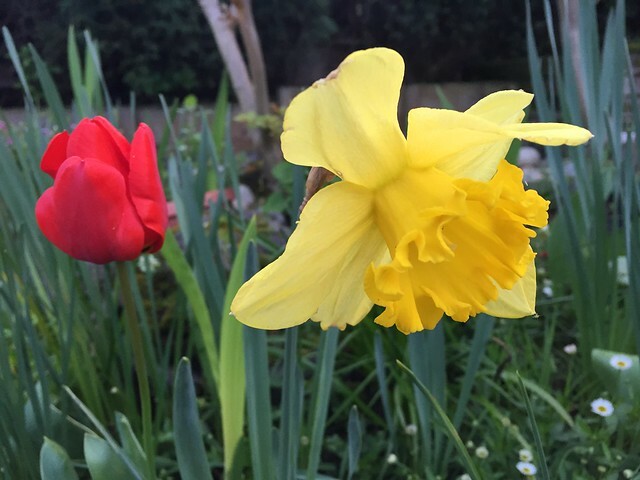 Not really interested in starting any monumental projects and somewhat hampered by the changeable weather which is almost spring but still not sandal weather. In fact pouring today so the March rain prediction has happily come true. Our parched California landscape appreciates that for sure. 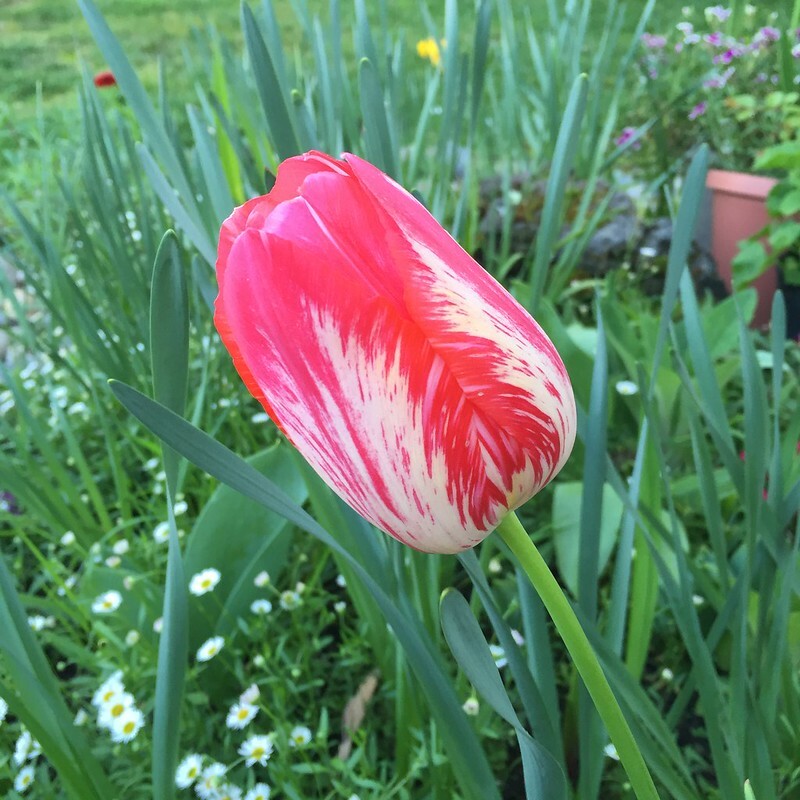 Changing things up I will put the garden photo near the top today - this bicolor tulip is perfection! Checking on my last post here it was back in mid-February. I told myself I was going to take a bit of a sewing and blog break but actually didn't think it would happen. However that coincided with my "un-motivation" so there you have it. And now I have plenty to write about and some new projects already started. Onward to spring! By the way - this past year I have been involved with some consulting projects - completely separate from sewing and so was not available for teaching as much as I would like. But that project is done. Which leads me to my next topic. If you are going to be in the bay area this year and want to have some personal sewing instruction please get in touch! I have also been thinking about the possibilities of video consultations. It's so easy to do a Skype call and very fun to meet - even when it is across the internet. 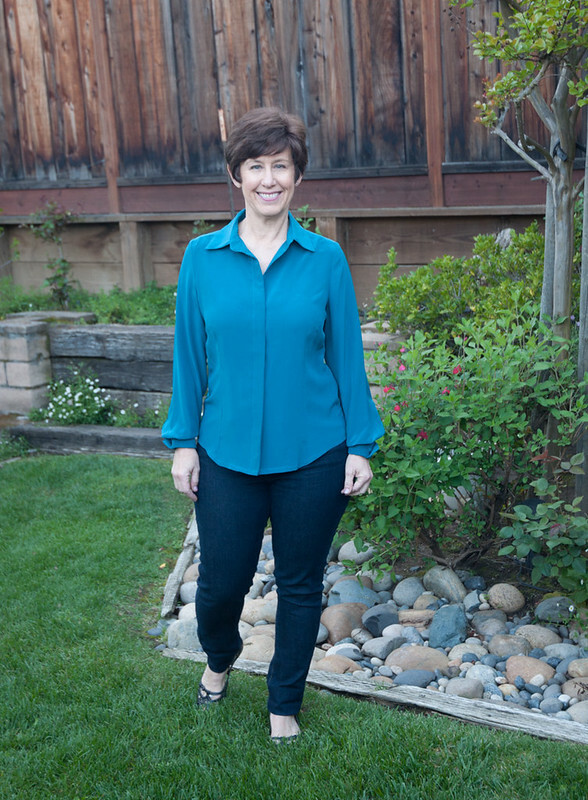 Perhaps you have questions about a specific technique, fitting issue, want to discuss pattern options, help with a tailoring project or just general sewing guidance? This is an idea I have had for a while - I am planning to add more details on my sewing lesson website but please leave a comment here if you think this could work, if any of you would be interested, or have any feedback or suggestions on this idea. Some finished projects will soon get their own blog posts. 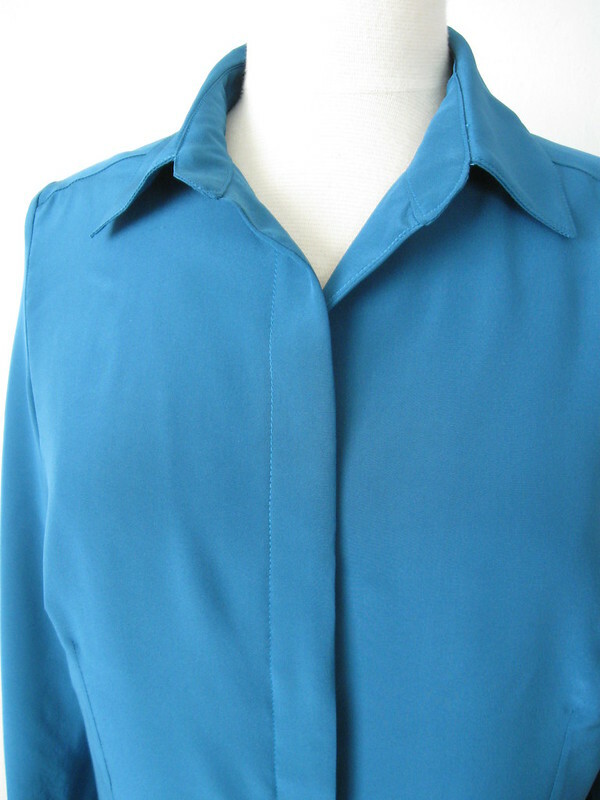 This is the silk blouse with the hidden buttonhole placket. I just love the idea of the hidden buttonholes in a silk like this - takes all the stress out of making a perfect buttonhole that would be front and center in all its triumph or tragedy depending on how my buttonholer was working on the day. Never fear though - and this technique can be used on most any shirt. I promise a post on the "how-to" very soon. I have written a post for Craftsy on this topic which I believe they will run near the end of this month - with a color coded example I created. It looks a little goofy but I love a color-coded example and it just helps see where all the pieces go. I will post here as well. And one of these days when the sun is shining I will photograph this shirt on me. New Vogue patterns - I always love the summer release and this time was no exception - some are just calling my name. But I have yet to get much wear from last summer's dresses so I will refrain for the time being. Some pattern testing is going on around here - something I rarely do but I bet you can guess which indie pattern designer it is for. New patterns in April I believe. And a real version already planned out in my head. Lastly - I have done some fabric designs for MyFabricDesigns.com and I am very impressed with the quality of the fabric that has arrived. So those are also in my sewing queue.